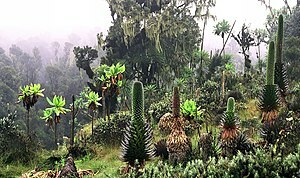 ↑ Flowers of the Moon, Afroalpine vegetation of the Rwenzori Mountains, Schutyser S., 2007, 5 Continents Editions, আইএসবিএন ৯৭৮-৮৮-৭৪৩৯-৪২৩-৪. Wikisource has the text of the 1920 Encyclopedia Americana article Ruwenzori. UWM.edu: 1937 aerial photographs of Rwenzori Mountains — University of Wisconsin-Milwaukee Libraries Digital Collections.